It might be the season, but coming right on the heels of our recent post on Sausages and Grapes, today’s post once again features a mixture of sweet and savory ingredients. Whereas that post combined fruit and meat, today we’ll take a look at a fruit and vegetable combination from Sicily: Orange and Fennel Salad. To my mind, it has everything you could hope for in a salad: it’s beautiful, healthy and delicious. Orange and Fennel Salad is also quick and easy to prepare. All it is, after all, are slices of orange and fennel arranged on a plate—’composed’ in culinary lingo—and dressed with olive oil and seasoned with salt and pepper, perhaps with few olives and fennel fronds for garnish. 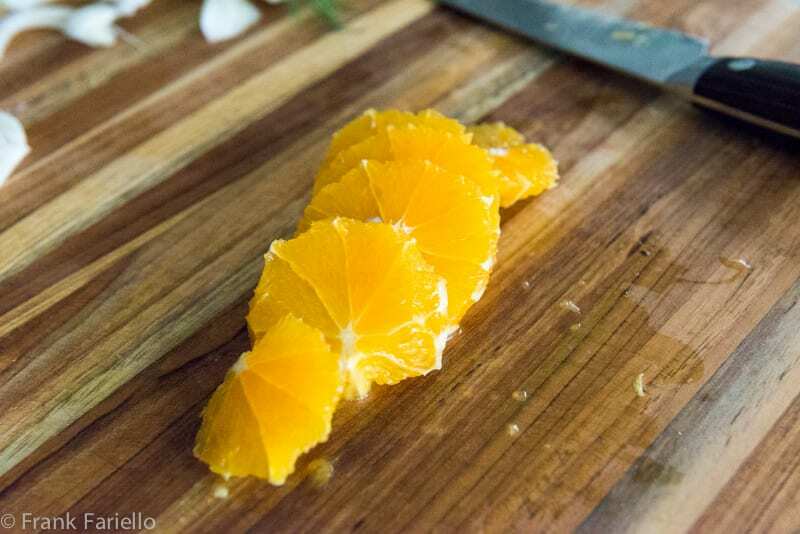 Both of the main ingredients in Orange and Fennel Salad, however, need to be prepped in a certain way, so I’ve included step-by-step photographic directions here to show you how. Salads are usually classified as contorni, or side dishes, in an Italian meal, but when it’s presented decoratively as we’ve done here, Orange and Fennel Salad can stand alone as an antipasto or, as its own salad/fruit course. It’s a refreshing way to end a substantial meal. 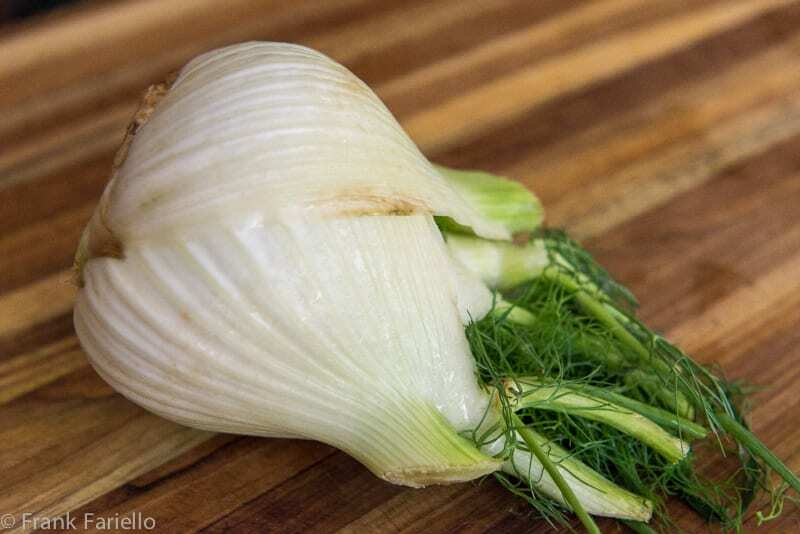 First, prep the fennel: Take your fennel bulb and inspect it. The one I’m working with today is rather large and bit discolored, as you can see—not uncommon for most fennel you will find in supermarkets. It’s hardly ideal, but with some careful trimming and slicing, we can turn this rather sad piece of vegetable into something salad-worthy. 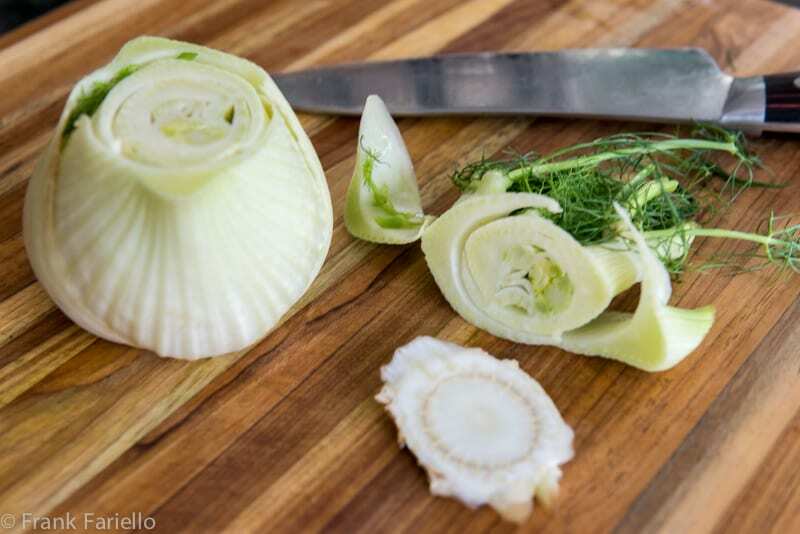 Trim the fennel bulbs top and bottom. Second, prep the oranges: Trim them top and bottom. 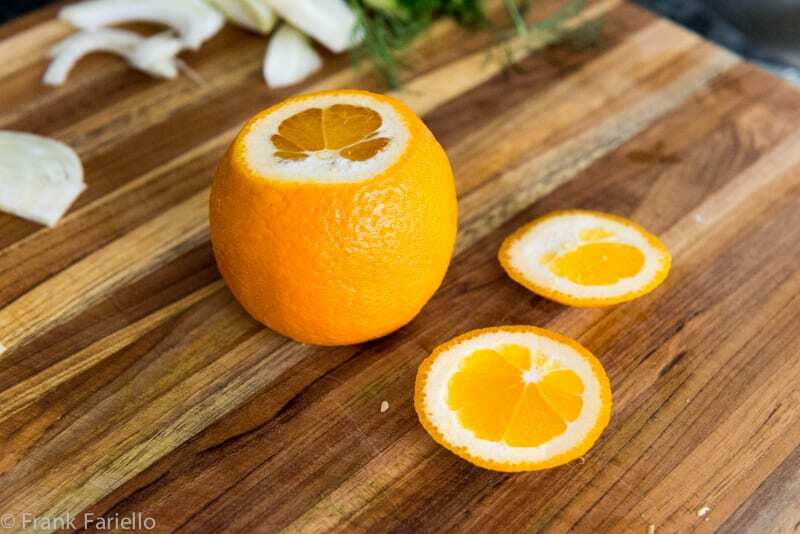 Once the orange is peeled, trim off as much of any remaining pith as you can. 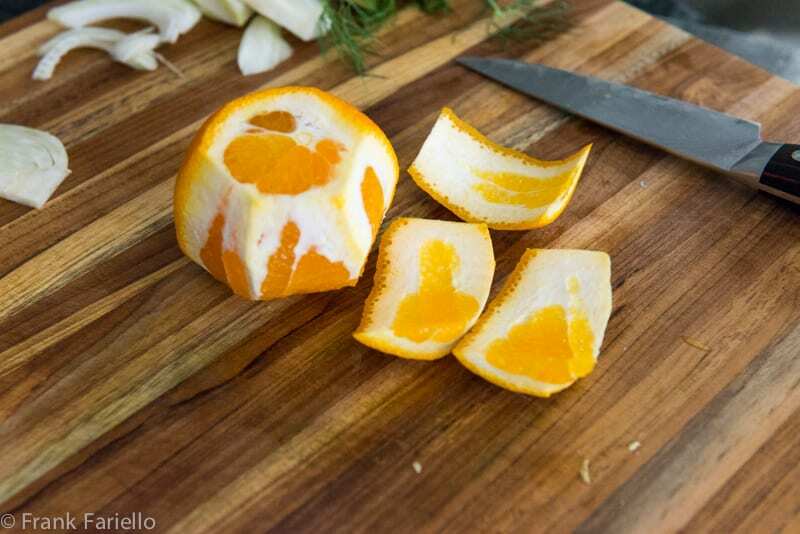 Then slice the orange horizontally into thin, rounds. Third, compose the salad: Arrange the fennel and orange slices decoratively on a serving plate (or, even better, on individual plates if you have the time). Season with salt and, if you like, freshly ground pepper. Garnish with the black olives if using and drizzle everything very generously with the olive oil. And for an elegant final touch, if you like, top with bits of fennel frond. This is one of those simple dishes that relies entirely on the goodness of its ingredients. You should look for a best quality, fruity extra-virgin olive oil, the kind that is dark green in color. And since Orange and Fennel Salad is a Sicilian dish, the oil would ideally be from Sicily. Here in the States, I’d recommend Frantoia brand olive oil, one of my favorites for any dish, Sicilian or not. It’s not cheap, but then no good olive oil is. The fennel should be young and therefore not too large, if you can find it. Smaller fennel bulbs are more tender, while the larger, older bulbs tend to get a bit fibrous. 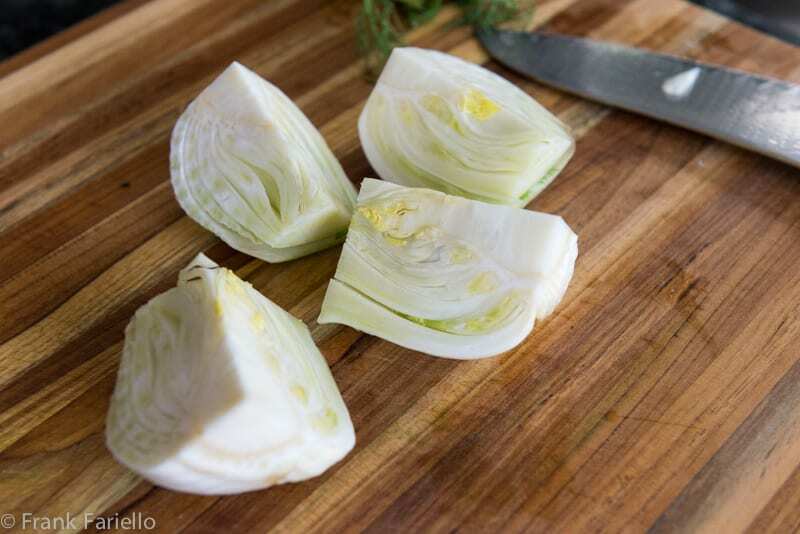 Older fennel is fine for cooked dishes like finocchi gratinati (Fennel Gratin) or a Fennel Sfornato, but for salads like this one, look for the young kind. If all you can find are the larger bulbs, however, no worries: you can make do by removing their tough outer layer, as mentioned above, and slicing them just as thin as you can manage. As for the oranges, good old navels will do just fine, but feel free to choose the types that appeals to you (Satsumas are in season at the moment and would do very nicely indeed, I think) or even other citrus fruits like a pomelo or grapefruit. I like to compose my Orange and Fennel Salad, but for a homier tossed version, cut the fennel into strips (removing the base that keeps the layers together) and the oranges into sections and toss them with the oil, salt and pepper as you would a typical Italian salad. There’s no need for vinegar in this salad—even if most recipes I’ve seen in English call for it—since the juice of the oranges will mix with the oil to make a dressing. But I have seen Italian recipes that call for some additional orange or lemon juice. Garnishing with black olives is an optional but lovely touch, as are the fennel fronds. Some recipes call for bits of walnut, which would be particularly nice this time of year. 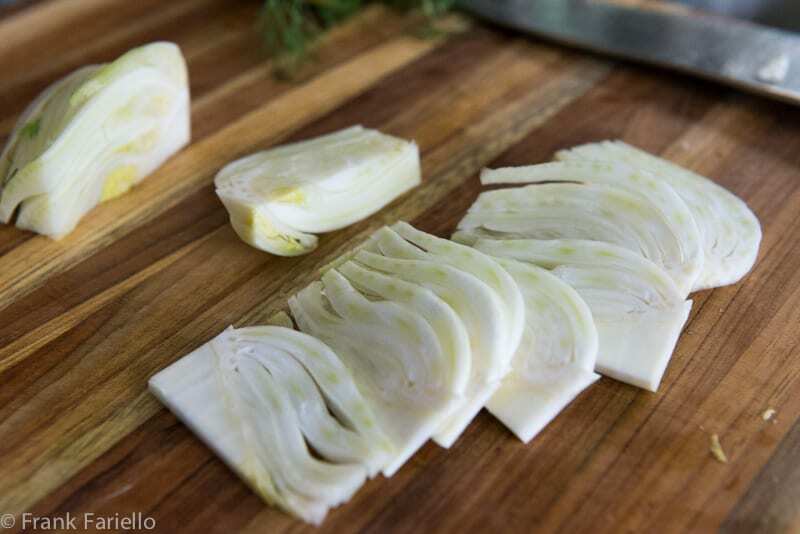 Prep the fennel: Trim the fennel bulbs top and bottom. If you're working with a larger, older fennel, particularly one that is spottled like this one, remove the outer layer. Now cut the bulb into quarters, then slice each quarter very thinly from top to bottom, making sure that each slice has a bit of the base, which will hold the slice together. Whenever I make “authentic” Italian dishes, I look for recipes to give me ideas of things to add & to refresh my memory if it’s a dish I haven’t made in a while. The 4th of July has been an old school family picnic and as such, I like to bring our old world dishes. Your Italian tuna & rice salad is exactly on spot! Perfetto! I would like to make the Orange fennel as well, but can I do this a day ahead or not advised? Would green olives work well in this salad? Black ones are classic, especially for the contrasting color, but sure, green ones would do fine in a pinch. A go too salad for us as with two prolific orange trees, perch no? Fresh and simple to assemble, it makes a spectacular table centerpiece as well. You’re so lucky to have your own orange trees, Paula. I’m jealous! My thesis advisor was Sicilian, so of course I learned to make this and other Sicilian dishes (similar ones are made in neighbouring Tunisia and Malta). I was glad to come across the blood orange and sweet onion recipe as some people hate fennel, anise etc. It is as divisive as fresh coriander/cilantro. Please don’t throw away any slightly discoloured fennel, as with stems and other salubrious discards it can go in a plastic bag in the freezer for stock. Yes, this takes top-quality olive oil. I do use good but not top-quality Greek extra-virgin oil for cooking. Yes, it’s funny how some people detest anice flavors. I love them. Licorice was my favorite candy as a kid. LOVE the combo of oranges and fennel. Gorgeous salad, and I know how tasty it is. Thanks! Frank, do you have any ideas for using pompelmi (grapefruits)? I have a tree in my yard that is loaded with them, and I’m trying to find more uses for them, besides juice, and just eating them in slices. Well, I’d say that this salad would actually work very nicely with grapefruit, actually. They pair nicely with arugula for a different kind of salad. And they make a wonderful sorbetto or granita as well… Personally I’d experiment with recipes that call for other citrus fruits, I’m sure that most of the time grapefruit would work perfectly. When I’m in Sicily, there is one meal I must always have: grilled swordfish, with caponata as a contorno, followed by a salad of orange and fennel. I’ve also had (and made) the salad with blood oranges and some toasted pinoli. Delicious and refreshing. Agreed! Blood oranges are extra special in salad. I usually pair them with onions for whatever reason. Habit perhaps? 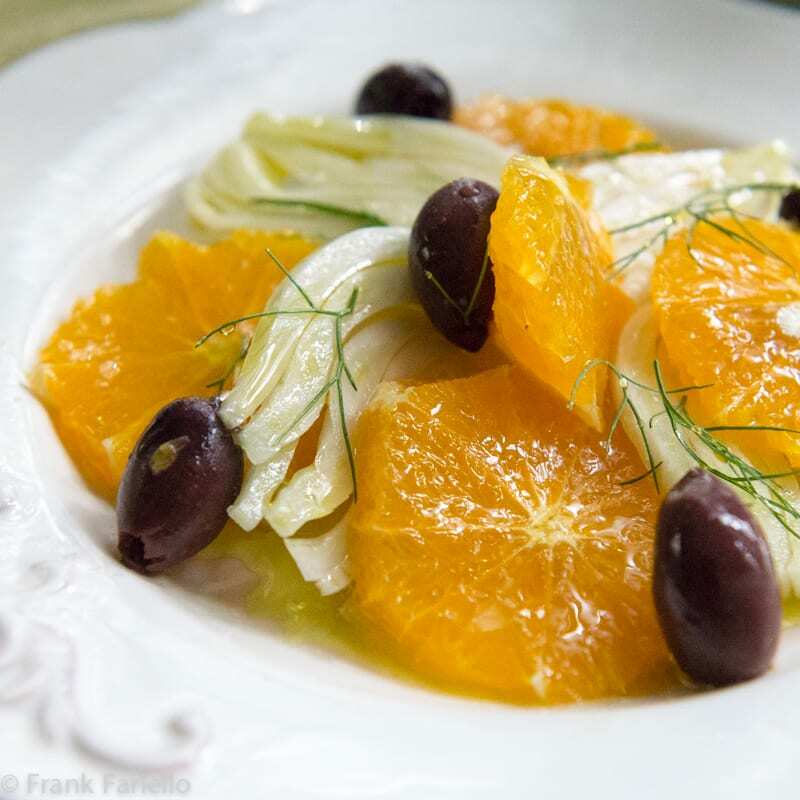 Orange and black olive salad has been a favorite of ours for years – but I have never added fennel, which we love. Frank – did you get my email by chance? Would you mean this one for peperoni al gratin by any chance? It’s just getting to orange season here in Australia and this is a fave of mine. My local olive grower (Adelaide had a blessed mediterranean climate) air dries some of his kalamata olives. They are intensely flavoured and great in this salad. It’s often my whole lunch! But great to accompany fish as well (as mentioned by Ciao Chow Linda). Your posts are so full of detail I feel I will have to start calling you Frankapedia! Frankapedia… I like it! 🙂 Thanks for stopping by, MLT! Great story, Cristina. And thanks for the shout out! It is easy to make, Mark. Well worth a try! Thanks for your comment. What a beautiful salad. I’ve had something similar, made with blood oranges, and loved it. I’m especially interested in the olive garnish! I think it would nicely complement the orange. Thanks Frank, for reminding me how I love this salad. I typically serve this (or a variation of it) on Christmas eve, since it’s a nice counterpoint to all the seafood. It certainly would be a perfect match. I like fennel salad and like orange salad: I’ve never had the two together, though. I must try when fennel is ready to pick at my winter CSA. Do so without delay, Simona. It’s a lovely combination! aspetterò le arance siciliane più succose e poi proverò a farla, grazie per questa idea Frank, buon weekend ! Buona idea! Magari avessi la possibilità di fare questo piatto con i tarocchi siciliani! That sounds so nice, Paola! I love this salad! Now is such a good time for it because the fennel bulbs are smaller. By mid-winter they are huge. What I love about it is the brightness it adds to a winter table. The addition of the olives adds a grand taste-touch. Thanks, Claudia! And you’re so right—it’s the perfect time of year! Thank you, Frank! We would have this salad on Christmas Eve dinner but the fennel and olives were in a side dish. Very good! I’ a first born American from parents born near Naples and Foggia. Thank you for your recipes! And thank *you* for your readership, Marie! I remember seeing this salad in an Italian cooking magazine, but made with thin slivers of onion instead of fennel. That’s a slightly different salad, which I’ve posted on, too——it’s equally delicious! What a beautiful salad!! 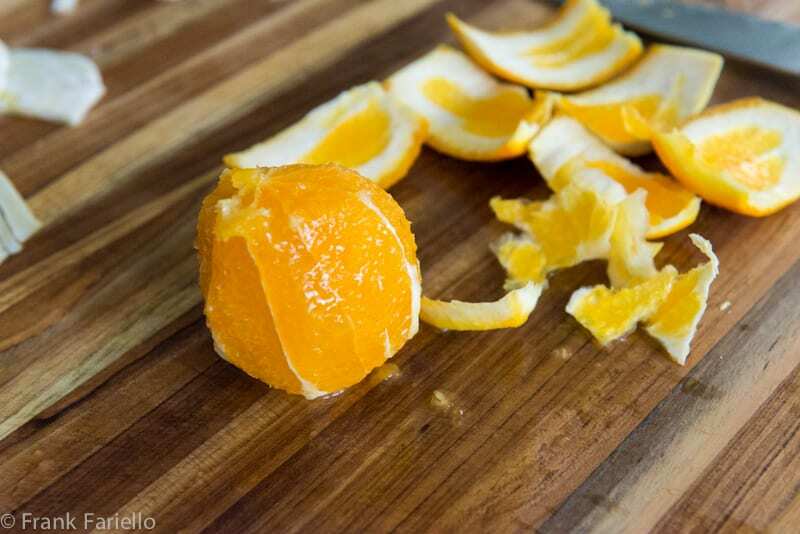 I love the colors and your photos capture the juiciness of the orange slices perfectly. I made a salad using your basic ingredients only added quinoa to it. It was really good!! I love dishes that are pleasing to the eye as well as the palate. Great recipe.